Evisol’s ThoRR concept is yet another fully electric sportscar. The car has no modern features such as ABS, power steering and sound absorption, but it does have a Lotus Super 7 type chassis and a Siemens electric motor with a set of Lithium Polymer batteries. The Siemens electric motor gives out a continuous output of 91hp and a maximum of 272hp. It has 160Nm and 450Nm torque. 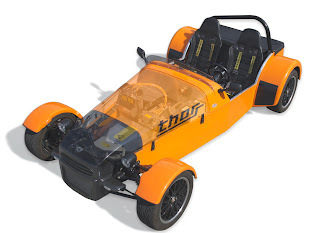 The ThoRR doesn’t have a gearbox and it only weighs 755kg’s. Evisol has not yet produced performance figures yet. The batteries have enough power to power the ThoRR for 200km. Price isn’t known on the vehicle yet and there are no auto insurance quotes yet.